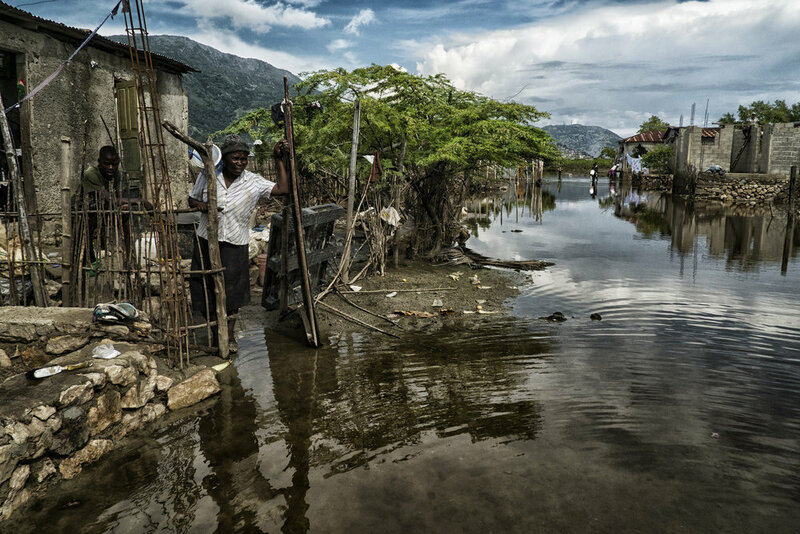 Flooding in Cap-Haitien, Haiti. Photo: United Nations. It's been about two years since I completed a series of field studies of water governance in Haiti. Our project in northern Haiti finished up about a year later. It's gratifying to work on development projects on-the-ground, but it's also rewarding to take those experiences and share them with the broader international and academic communities. Two articles I wrote about water governance in Haiti have been published recently. The first is a broad look at Haiti's water laws and policies, and the institutions that develop and enforce those laws. The article has been published by the Tulane Environmental Law Journal and is available online here. This special issue of AQUA-LAC is a magnificent example of the solidarity expressed by the International Hydrological Program for Latin America and the Caribbean (IHP-LAC) in promoting the integrated management of the water resources of the Republic of Haiti. Indeed, in its report in 1972 on integrated technical assistance in Haiti, the OAS stated, “The development of Haiti’s natural resources is to a large extent linked to maximizing the rational utilization of its water resources. Failing these factors, the country’s agricultural and industrial development, as well as the life of its inhabitants, will be confronted by severe limitations” (OAS, 1972). This issue has 9 articles written by authors from three countries: Haiti, the United States and Mexico. They cover very diverse fields, ranging from the reconstitution of extreme rainfall events in Haiti – currently a highly pertinent topic with climate change and extreme hydrological phenomena – to an analysis of water governance reform in Haiti, which emphasizes the numerous challenges that have to be overcome to achieve integrated and rational water management. Furthermore, four articles refer to the water resources of the Trou du Nord watershed, which supplies the industrial zone of Caracol. They provide analytical elements on research issues that not only have to be taken further with respect to this watershed, but which can also be transposed to other watersheds in Haiti in view to carrying out comparative studies. Regarding water intended for human consumption, the results of an evaluation of microbiological risks highlight the danger of Crytosporidium oocysts for the health of the population. The issue of water in emerging non-secured districts is also studied and presented in an article on water supply to Canaan. The analysis of epidemiological transition linked to hydrometeorological disasters provides methodological tools and calls for specialists in water and health sciences to carry out multidisciplinary actions to establish, and experiment with, protocols aimed at facilitating the development of new tools for preventing and controlling certain water-borne diseases. This special issue addresses the urgent need for the Haitian authorities to establish a national water policy. By relying on the basic principles of integrated water resource management, I strongly believe that this reform will lead the country in the short, medium and long terms to: (i) reduce the environmental risks linked to water, (ii) better satisfy the population’s needs for water, and (iii) solve conflicts between the different actors in this sector. My administration is committed to this process by proposing legislative and administrative changes, and by making new choices for investment in the water sector by waging on stronger scientific and technical cooperation between and IHP-LAC. This is the context in which I have made the management and control of surface water a major goal of my governmental program. Introducing "Water Governance in Haiti"
The Trou-du-Nord River in northern Haiti, near its mouth in Caracol Bay. Photo: Ryan Stoa. Haitians will go to the polls on Sunday to vote in their national elections, seven months after the Haitian Parliament dissolved and left the executive ruling by decree. Considering the sorry state of water services in the country, water has been on the political agenda for months. But the administrative capacities are so low, and the information so scarce, that it's hard to know who the players are in the Haitian water sector, what laws govern them, or how capable those agencies are to carry out their mandates. The first phase of this study collected and analyzed the laws, policies, and institutions involved in water resources management in Haiti. Results from that phase suggest that the laws and policies affecting water resources create a fragmented and uncoordinated water management framework, in which national ministries have overlapping mandates and rarely coordinate their efforts effectively. In addition, while the legal framework transfers significant management authorities (and responsibilities) to local governments, there is little else in the way of statutory or regulatory guidance for these governments to rely on. For that reason, the legal framework creates broad ambiguities regarding how local governments are to be financed, staffed, or otherwise carry out their water management duties. These uncertainties could, in theory, create the interpretational space needed for local governments to experiment with water management strategies and techniques in ways that foster resilience and increase sustainability. In practice, it seems more likely that opaque legal mandates would create confusion and leave local governments ill-equipped to tackled the daunting challenges of water management. The following case study of institutional capacities in the Trou du Nord watershed in northern Haiti suggests that most agencies and stakeholders have neither the human nor the financial resources in place to fulfill their mandates. Some, however, such as DINEPA’s local representatives or the University of Limonade, are relatively well-staffed and exhibit the continuity of presence needed to justify targeted capacity building efforts. Others, such as the sections and communes in the region, may have low levels of capacity in water resources management but merit engagement in order to secure broad participation in water management planning efforts. The institutional capacity analysis that follows has been conducted with an eye towards informing the final component of the IDB project funding this study: an integrated water resources management plan for the Trou-du-Nord watershed. The Trou du Nord river is located in the Trou du Nord Arrondissement, a subdivision of the Northeast Department of Haiti. The Arrondissement contains four communes: Caracol, Saint Suzanne, Terrier-Rouge, and Trou-du-Nord. These communes comprise the local government bloc of stakeholders most integral to a participatory water management planning strategy, as they represent the core geographic regions of the watershed, while exhibiting a level of regulatory and management activity that lower levels of government (i.e., sections within the communes) lack. For the most part the four communes do not employ any full-time staff dedicated to water resources, though some activities fall within the broad scope of water management. More important, perhaps, is the local support and buy-in that would be needed from each commune to effectively carry out a water management plan that modifies the status quo in any meaningful way. Caracol is a flood-prone coastal commune on Caracol Bay, at the mouth of the Trou-du-Nord river. It is sparsely populated, but due to the Caracol Industrial Park’s presence, demographics are in flux and electricity is reliable. The commune reports a total annual budget of less than $195,000, of which over 40% comes from a European Union development project. The 39 staff receive an annual salary of around $4,320, but none are dedicated to water management per se. A significant portion of commune tasks pertain to waste management, accomplished with wheelbarrows and two motorcycles. There are no vehicles, nor is there a disposal site in the commune. While commune staff do not engage in water management themselves, they do work closely with DINEPA staff on water projects when necessary. On the opposite end of the watershed, the commune of Saint Suzanne sits at the source of the Trou-du-Nord river and comprises a significant portion of the watershed’s catchment area. The overall budget and staff salaries are similar to those of Caracol, though in practice staff are often not paid on time. The office has one functioning computer, one motorcycle, and no human or financial resources dedicated to water management. DINEPA’s presence is minimal, supplemented by periodic wells drilled by international NGOs. Staff conduct street cleaning, but lack an official disposal site. Hygiene facilities are minimal to non-existent. The communes of Terrier-Rouge and Trou-du-Nord lie between upstream Saint Suzanne and downstream Caracol. Terrier-Rouge is the eastern commune, sitting directly on the Route Nationale of the northern transportation corridor. The industrial park has financed new housing projects and reliable electricity in the commune. A municipal engineer on staff facilitates the issuance of construction permits, and the commune has hired eight staff to conduct reforestation work. Most other staff are engaged in street cleaning. The commune lacks a waste disposal site, though plans are in place to build a site capable of serving multiple communes. DINEPA’s presence, and hygiene facilities, are minimal and supplemented by international NGOs. The overall budget and staff salaries are similar to those of Caracol, with neither dedicated to water management in any meaningful way. Finally, the Trou-du-Nord commune forms the western flank of the watershed. The river flows through the commune before passing by the industrial park. While no housing projects have been constructed its proximity to the park has enabled reliable electricity throughout the commune. The commune is relatively well-staffed, with an engineer on hand to issue construction permits, and staff engaged in waste management and small-scale hygiene projects. However, little infrastructure is available for these purposes, as the commune has only one tricycle and some wheelbarrows, no disposal site, and a dysfunctional water supply system. The third in a three-part series on disaster and displacement in Haiti. Read the rest of the series: Part I, Part II. Five years since the earthquake, the number of people living in camps has dropped by over 90%. Still, between 100,000 – 150,000 remain, and for those that returned to their homes, life remains difficult. 67% of households that were displaced by the earthquake are unable to meet their basic needs, compared to 43% of households that were not displaced. Families that were displaced are more likely than non-displaced families to report that their living conditions have worsened, that they feel insecure, or that they have poor access to water, sanitation facilities, or healthcare. Despite a reduction in the number of people living in camps, replacing what was lost during the earthquake and its aftermath remains a struggle. Of additional concern though is the prospect of another disaster, be it an earthquake or a hurricane. The particular legal problems addressed above have received little attention, and what attention has been paid appears not to have made a significant change to realities on the ground. The second in a three-part series on disaster and displacement in Haiti. Read the rest of the series: Part I, Part III. Once 1.5-2 million Haitians lost their homes, displacement was exacerbated by complex property laws and land tenure administration. Simply put, it is difficult to confidently know who owns what in Haiti. Formal institutions purporting to administer property rights function poorly, giving rise to informal arrangements between landowner and occupant. The informal system works well enough for Haitians, but was mistrusted by foreign aid agencies financing reconstruction. The agencies sought durable solutions that provided tenants with security and a respectable standard of living, ignoring the fact that poor living conditions had been the norm before the earthquake. The disconnect forced many to continue living in camps far longer than necessary as agencies grappled with property law entanglements. The camps themselves became the subject of land disputes as owners of land on which camps were established tried to evict camp occupants from their land. Fearing that settlements would become permanent, landowners asserted their rights under national law to evict occupants and, when that proved unhelpful, by other demonstrations of power, including force and corruption. The international community, meanwhile, leaned on international law to block evictions, including human rights law and international principles on internal displacement. The government was unable to mediate as it had conflicting interests (some camps were on public lands), and through its numerous institutions did not speak with one voice. Thus an archaic and complex land law and land administration system paralyzed the effort to return displaced communities to their homes. On the other side of the island of Hispaniola, the Dominican Republic uses its own laws to frustrate Haitians displaced from the earthquake. This is the first in a three-part series about disaster and displacement in Haiti. Read the rest of the series: Part II, Part III. Port-au-Prince is Haiti’s capital and most populous city, with a metropolitan population of nearly 2.5 million. On January 12, 2010, a magnitude 7.0 Mw earthquake struck 25 kilometers southwest of the city. An additional 52 aftershocks with a magnitude of at least 4.5 followed. The island of Hispaniola – which Haiti shares with the Dominican Republic – is no stranger to extreme natural events like earthquakes and tropical cyclones, but the 2010 earthquake was unprecedented in its destructive impact. Death toll estimates range from 100,000 - 300,000. Critical infrastructure designed to respond to disasters (e.g., hospitals, roads, seaports, airports, communication systems) was destroyed. Many of the city's other buildings - including private residences, government institutions, and business centers - were likewise completely or functionally destroyed. In sum, Haiti’s largest city and the epicenter of government and economic activity was ground to a halt. While recovering and respectfully disposing of the deceased proved trying, responding to the needs of the living became a challenge of epic proportions. The United States Agency for International Development estimates that 1.5 million people were displaced into some 1,500 camps. Many others forced to leave their homes sought refuge with family in other parts of the country. And by almost all accounts, the response to displacement was inadequate. A year after the earthquake 500,000 Haitians were still living in camps, and although the rough official number in 2014 was ‘only’ 100,000, the effect of displacement is persistent and hard to fully discern in a city where camps can be hard to distinguish from slums. A 2014 survey found that 74% of families forced to leave their homes in 2010 still consider themselves displaced, even though they no longer live in displacement camps. Meanwhile, life in the camps was ill-conceived: many had no electricity, clean water, sanitation facilities, or protection from the elements. Sexual, domestic, and gang violence was common, and a cholera outbreak (likely introduced by foreign aid workers) exacerbated a fragile public health environment. The inadequacy of the response to displacement has many intertwined roots, the totality of which is still being uncovered. One of the most distressing concerns for Haiti and the international community, however, was (and continues to be) the weak legal framework designed to mitigate and respond to extreme natural events.